Alexis joined the firm in 2016 and focuses her practice on environmental, land use, and construction law and litigation. She also maintains an active pro bono practice in partnership with a wildlife conservation organization. Prior to joining SPR, Alexis worked in the Litigation group at Paul Hastings LLP where her practice focused on commercial litigation, government and internal investigations, and pro bono immigration work. Prior to Paul Hastings, Alexis was a post-graduate legal fellow at the Sabin Center for Climate Change Law at Columbia Law School. Alexis is a graduate of Cornell Law School, where she served as an articles editor of the Cornell Law School International Law Journal and was Chair of the Environmental Law Society as well as Co-Chair of the Alternative Dispute Resolution Society. 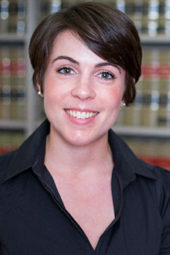 She participated in the law school’s Water Law and Land Use Law clinics, created an externship with the Community Environmental Defense Council to work on hydrofracking issues, and interned with the Natural Resources Defense Council and New York State Department of Environmental Conservation. Bianca Howard & Alexis Saba et al., “Combined Heat and Power’s Potential to Meet New York City’s Sustainability Goals,” Energy Policy, vol. 65(C), 444–454, 2014. Alexis Saba & Michela Biasutti et al., “Getting Ahead of the Curve: Supporting Adaptation to Long-term Climate Change and Short-term Climate Variability Alike,” Carbon and Climate Law Review, 7(1), 3–23, 2013.